India 6-383 (Rohit Sharma 209, MS Dhoni 62, Shikhar Dhawan 60, Xavier Doherty 2-74) beat Australia 326 (James Faulkner 116, Glenn Maxwell 60, Mohammed Shami 3-52) by 57 runs. Virender Sehwag (219) and the little master, Sachin Tendulkar (200*) are the two other batsmen who have hammered double centuries in the ODIs. The Men in Blue powered 383 runs for the loss of just six wickets in 50 overs and the Kangaroos managed 326 with 29 balls to spare. Rohit Sharma (India) was declared ‘Player of the match’ for his magical knock of 209 off 158 mere balls with 16 towering sixes and 12 fours. He created a world record in the ODI cricket by dispatching 16 powerful sixes in an innings, surpassing 15 previously hit by Shane Watson on April 11, 2011, vs. Bangladesh in Dhaka. The game was held at M Chinnaswammy Stadium, Bangalore, on Saturday, November 2, 2013. Earlier, George Bailey, won the toss for the visitors and invited the home side to bat first. 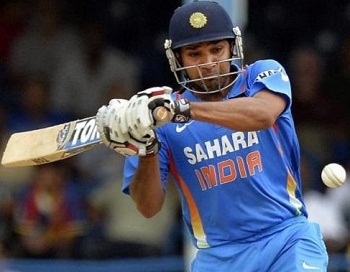 Rohit Sharma along with Shikhar Dhawan provided a solid beginning for their side with aggression. The latter completed his fifth ODI fifty and the partnership was broken at 112 in 18.6 overs when Dhawan was gone for 60 and Virat Kohli was run out for a duck. Rohit Sharma took over the charge, preferred to attack and dispatched his fourth ODI hundred as India lost its fourth wicket at 207. Their skipper, MS Dhoni, got in next and maintained the tempo of scoring with the opener who was toying with the Aussies bowling. The first attained his 49th ODI half century whereas Rohit Sharma plundered his maiden double ton and finally lost his wicket for 209. Dhoni scored 62 as the hosts piled up 6-383 after the allotted 50 overs. Xavier Doherty held two wickets whereas Clint McKay and James Faulkner got one each. The Kangaroos surrendered their first wicket at seven while Phillip Hughes and Brad Haddin took the score to 64 as the first was dismissed for 23. Brad Haddin was clean bowled by Ravichandran Ashwin for 40 whereas George Bailey and Adam Voges went back to the pavilion after scoring four runs each. Glenn Maxwell and James Faulkner enhanced the score to 132 as the first departed back for 60. Shane Watson scored 49 quick fired runs and the Aussies were 7-205 in 28.2 overs while the 8th wicket went down six runs later. Clint McKay joined in with James Faulkner who continued with his blast and registered his maiden ODI ton on the 57th ball he faced. The 9th wicket association produced 115 runs, Faulkner amassed 116 off just 73 with 6 giant sixes and 11 fours as Australia was bowled out for 326 in 45.1 overs. Mohammed Shami and Ravindra Jadeja were the top wicket takers with three each, Ravichandran Ashwin claimed two whereas vinay Kumar chipped in with one wicket. India won the encounter by a margin of 57 runs and clinched the seven match series 3-2.